Please reconfirm to this department that your master card was successfully received and that you officially signed before handing over to you. If you have not yet receive it,you are to contact the United States Custom Department, a person ofMrs Sesan Hendersonthe admin director, with your full name, address, telephone number, occupation and a copy of your working ID, as that's where your ATM master card was directed at the moment and ask herwhat you need to do in order to receive your master card. Let him know that we directed you and be polite in your request to avoid you being declined. Contact them with your full details and ask her how much it will cost to deliver your E' master card to your home address. PRESIDENTIAL COMMITTEE ON FOREIGN PAYMENT. 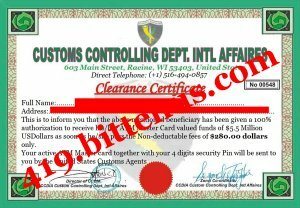 Subject: FROM THE UNITED STATES CUSTOMS CONTROLLING DEPT. INTL AFFAIRES. CUSTOMS CONTROLLING DEPT. INTL AFFAIRES. This is to inform you that your details have been officially received and according to the instruction from the United States Remittance Department, Mr Justice Freedom, you have been given the details of your ATM Master card delivery which requires our agents coming to your home address with your card together with your four digits Security Pin. However, your ATM Master card has already be rapped in a blue parcel printed your full name "" on it and will only be handed over to you alone for security reasons. We shall commence your ATM Master card delivery as soon as we receive your transfer slip. See attached your clearance certificate for better understanding and legitimacy purpose. Subject: UNITED STATES EXPRESS REMITTANCE DEPARTMENT. However, it's quite clear that you do not have the clearance fees of $4,300 dollars to for your total clearance in order to receive your funds and from all indications, you do not have this fees to pay. Now, if you are promising me that you will not disappoint me, i will direct you to a loan company where you can get a loan to clear this fees and receive your funds but please not that you must pay the loan back as soon as you receive your funds into your account. If this is okay by you and you know that you will not disappoint me, please get back to me so that i can direct you to the loan Company. This is what i have done for more than 150 beneficiaries now and non have disappointed one Man from New Jersey who refused to pay the loan back after he has received his funds and now arrested. Awaiting your quickly response now.